Progress on my CNC router platform has been progressing slowly but I've hit a few milestones. I got 4 RepRap 2nd generation motor controllers assembled and tested and have acquired 4 new NEMA23 steppers and one used high torque Xylotex NEMA23 from the local swap meet to use in the prototype. I got the X axis up and running and was quite pleased with the torque even the smaller steppers put out. I also picked up some nice 4-pin sockets, terminal strips, and limit switches for the prototype build as well as a few other electronic goodies at the SSARC Hamfest about 2 months back. As far as design goes, I've decided against the 1" square tubing and skate bearings design pictured above. It's just too bulky for anything other than the X axis so I'm going to switch over the the more traditional precision ground shafts and bearings for linear guides on all axes at this point. Other than being bulky, I like the design and will probably try to utilize it at some point in the future. I've already acquired some shafts and bearings for testing this new setup but have yet to cut new bearing brackets to install on the boot-strap platform. The overall design is on its second revision on paper with details for the X and Y axes specified and sketched up. 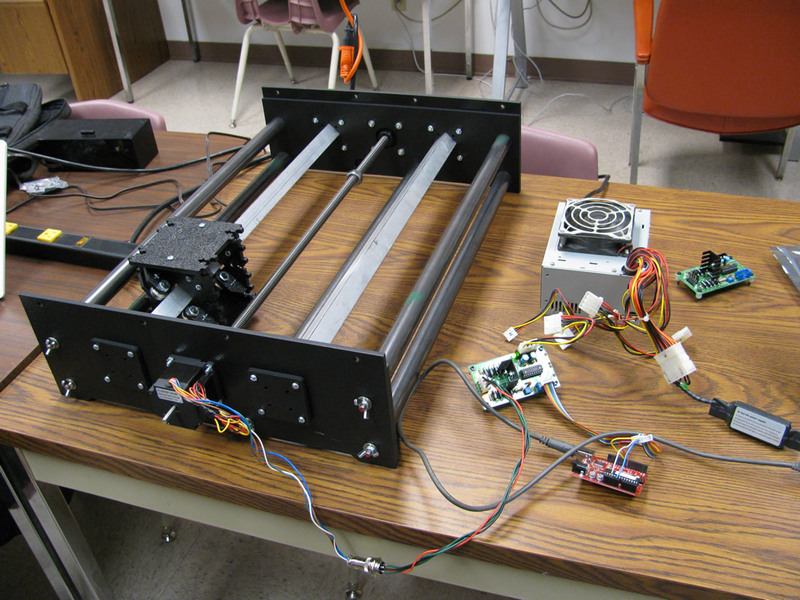 I'm looking at alternative linear motion setups that I could possibly fit within the specified budget so it may undergo another revision before I start cutting parts for the boot-strapped version. This project will likely progress slowly for a bit longer as I seem to have outgrown my current work area. I'm hoping to be able to move to a more suitable location in a few months time and set up a proper workshop, or at least that's the plan. This entry was posted on Sunday, December 27th, 2009 at 4:17 pm and is filed under News. You can follow any responses to this entry through the RSS 2.0 feed. You can leave a response, or trackback from your own site.